The smallest living primate is the mouse lemur, found in Madagascar. An adult weighs about 31 grams (1 ounce). The smallest primate that ever lived is believed to be a species in the family Eosimiidae that lived 45 million years ago in humid rain forests in what is now China. The animal's size is estimated from fossils of ankle and foot bones discovered in 1996. One species is estimated to have weighed about 10 grams, and the other 15. The primate was probably a tree-dweller that ate insects, fruit and nectar. It was eaten by owls–the recovered fossils may have come from bones in owl pellets. Daniel L. Gebo, Marian Dagosto, K. Christopher Beard, Tao Qi and Jingwen Wang. The oldest known anthropoid postcranial fossils and the early evolution of higher primates. Nature, volume 404, number 6775, pages 276-278 (15 March 2000). Daniel L. Gebo, Marian Dagosto, K. Christopher Beard, Tao Qi. Journal of Human Evolution, volume 38, number 4, pages 585-594 (April 2000). 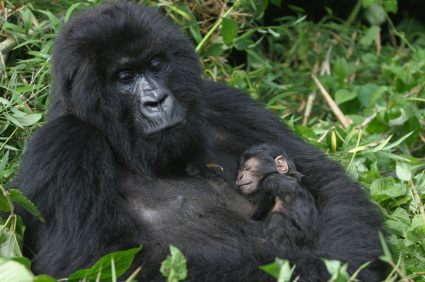 The biggest primate is the gorilla (Gorilla gorilla). Adult males weigh roughly 135 to 275 kilograms (300-600 pounds). (Some fatties in zoos have hit 300 kg.) Standing erect, which they rarely do, gorillas can have a height of as much as 1.75 meters (5 feet 9 inches). The span of their outstretched arms is 2 to 2.75 m (6.5-9 feet). If gorillas measured in fathoms, their fathoms would be longer than ours. The volume of a ball (a sphere) is four thirds pi times the cube of the radius. Using your calculator, you will find the Joe gorilla lollipop has a volume of about 0.52 cubic meters, and the King Kong 523.6 cubic meters. Check it yourself. That means the king Kong volume is 1000 times bigger. 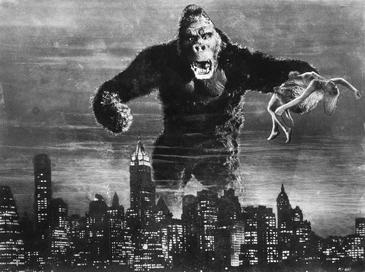 Assuming Kong would be just as dense as Joe ordinary gorilla, the mass of King Kong would also be 1000 times greater than Joe's. Now let's look at the stick supporting the ball. Gravity pulls the mass of the spheres down with a force that is almost all compressive. The strength of a material resisting compression is proportional to its cross sectional area. In this case of the lollipop stick that is a circle. The area of a circle is = pi times the radius squared. So the area for Joe is 490.9 sq cm and for Kong 49,087 sq cm, 100 times more. The stick on the King Kong lollipop has to support 1000 times more weight than the stick on the Joe Gorilla g. lollipop, but it is only 100 times stronger. It will break. No King Kong. Galileo pointed out this problem for large animals about 350 years ago. For vertebrates such as people and the gorilla, the stick, of course, represents bones. Bones are wonderful structures, able to resist many kinds of forces, such as twisting and bending. Compression isn't all they have to deal with. When a bone bends, one side is in compression, but the opposite side is in tension. The problem is even worse than the "100 times stronger" in resisting compression result makes it appear. Bones crack long before they fail in compression. Ask your local orthopedist. On a small planet or a moon like those of Mars, where gravity is weaker, a bigger gorilla could be possible, just as it's possible to have bigger volcanoes on Mars than on Earth. But then, the weaker gravity of such a small body would make it harder for it to retain its atmosphere, so perhaps biplanes could not be used to harass the beast. Last revised: 2 June 2018.